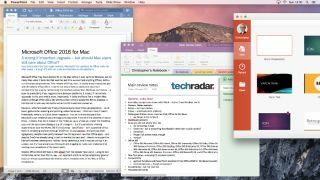 Microsoft has released a new version of Office 2016 for Mac, introducing new online features that bring it closer in line with the cloud-first Office 365. Microsoft Word, Excel and PowerPoint now feature automatic saving for documents stored in the cloud – a feature that could stop you losing hours of work to an accidentally closed window or system crash. Worried about accidentally deleting a chunk of your document and having the original overwritten? Office's upgraded Version History tool shows a list of changes and lets you roll back to an earlier version. Word, Excel and PowerPoint now offer live previews when you're working on a shared document. Flag icons show you where they're working (much like in Google Docs) and you can see what they're typing in real time. Each app has received its own updates as well. PowerPoint will highlight slides that have changed since you last saw them so colleagues can't slip in sneaky edits without you noticing, and Excel has a host of new charts and functions. Most interestingly, Outlook now integrates more closely with Google services, letting you manage your calendar and contacts within the app. Microsoft Office 2016 is the latest version of Office available as a one-off purchase. When Office 2019 is released later this year, Office 2016 users won't get it automatically; they'll have to pay again if they want to upgrade. Office 365 is the same software, but paid for via a monthly or annual subscription. It includes extra online storage via OneDrive, ongoing tech support and automatic updates. Office 365 users will get all the new features of Office 2019 as soon as it's released as part of their subscription.